Dell's full-featured UltraSharp 1901FP is a tough act to follow, but the UltraSharp 1905FP replaces it ably. Like its predecessor, the 1905FP includes four UBS 2.0 ports (two on the side of the bezel, and two in the back). It also follows its sibling's lead in allowing you to tilt the screen, pivot it, swivel it on its base, and adjust its height. With the second-highest test scores for text quality that we've seen lately, the 1905FP received a Very Good rating for text. Slightly ruddy flesh tones in our photo of people contributed to graphics scores that were middling among recently tested 19-inch LCDs but were strong enough overall to earn a rating of Very Good for graphics as well. The 1905FP's pixel redraw rate of 20ms is an improvement on the 1901fp's 25ms, but it's hardly ground-breaking--and we couldn't detect any improvement in how games and movies looked. Still, this monitor's excellent image quality, great array of features, and competitive price combined to help it capture Best Buy honors on our January 2005 chart. 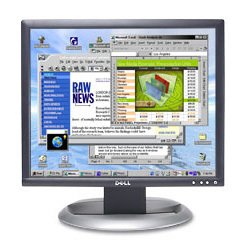 Upshot: The Dell UltraSharp 1905FP covers all the bases: screen quality, physical adjustability, and extras features.